Monitor Audio Bronze BX5 5.1 review | What Hi-Fi? The Bronze range has provided plenty of strong performing stereo and surround sound incarnations in its time. With this package we have a pair of floorstanding BX5 speakers at the front, two BXFX rear speakers, a BX Centre and the BXW10 subwoofer. In other words, this is a floorstanding version of the BX2 system that gained a fine five-star review. As with the BX2 package, the stand out feature here is those BXFX rear channels. These speakers are dual-mode and therefore able to switch between offering bipole and dipole configuration. They have one tweeter located on each side of the speaker – ‘on angled baffles', as MA puts it – either side of the mid/bass driver. This makes them ideal for rear channels, whether they are behind you in a 5.1 set-up, or to your side in a 7.1-channel configuration. In either format, they should make a cohesive sound field. And that they do. This system delivers a surround whole that envelops the listening position better than many other systems. While some packages use the uniformity of the satellites to a similar effect, the Monitor Audio package is better still at steering those surround details. The extra power and weight that the floorstanding front speakers add is tangible, too, with Robin Hood giving the system plenty of chance to show its muscle. 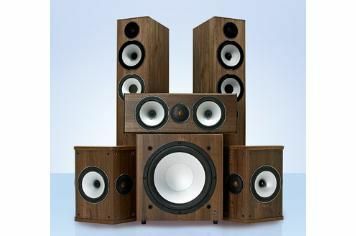 You certainly won't be bored with this system in your room, with excitement aplenty dished out alongside decent dynamics – the least you'd expect from such a hefty package with bottom end grunt. Subtlety, however, as we feared, isn't quite such a strong point. Fine detail recovery is found a little wanting in this company. The explosive action on offer from Terminator Salvation is undoubtedly enjoyable, but some detail and dialogue get slightly lost in the mix at times. The speakers don't have quite the all-out control that other systems here can demonstrate. Switch to two-channel music and this package is again good, but not quite unbeatable. With Swoon by the Chemical Brothers, the punch and power is there, and bass depth is impressive, but there isn't quite the dynamic subtlety to match the B&W 685 Theatre and Tannoy Revolution Compact 5.1 systems. The speakers themselves are nicely finished, well built and well presented, too – and we realise we've said this for every package here but that can only be a good thing. If you have a large room, the weight and power, coupled with the cohesiveness of the rear channels make for an enticing prospect but it's not quite the all-star all-rounder compared with rivals.